It’s been a while since I was first involved in the business social networks stuff; I think it was late 2004 when I subscribed to this new service named Linkedin which aim was to store and improve your network of people. It was love at first sight and helped me finding some of the best programmers I’ve ever worked with. It was also a chance for my first appearance on a national magazine (it was Class Magazine, if I remember well) in an article on the usage in business environments of this new thing named “social networks”. I then helped BJ Fogg with my contributions to the designing of the user interfaces and of the interactions of a different type of (then) business social network (centred on the voice interaction between users of the same community) named YackPack. 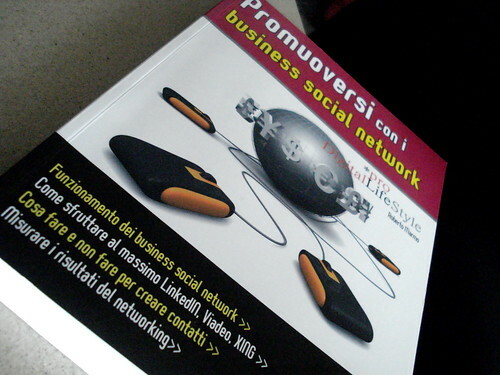 And then came Twitter, Flickr, Facebook and all the rest of the family; and today – if you live in Italy or can read Italian – the book written by my dear friend Roberto Marmo “Promuoversi con i business social network” (Promote yourself using business social networks) with all the how-to’s, the do’s and don’ts for the main social networks here around. This entry was posted in Beef and tagged book, business, networking, personal by admin. Bookmark the permalink. Well, thankyou Fabrizio. I usually prefere not to review books that features my self. But this is really a good book for anyone who dares to go deeper into social networking for business.